The family is heading to Madrid to visit my wife’s family this May. (Wife’s mom and dad immigrated to Australia and used to flying that route - so not worried about the time in air). However when we told her parents we were flying Iberia they were kinda like: “Hmmm okay”. We are used to flying AA or Qantas when we visit them in Sydney. Instead of asking us to respond to what appears to be prejudiced thinking, perhaps you might just want to ask some specific questions about IB product and service? I wasn’t thinking about anything specific, just the overall experience. To to help narrow it down, what are people’s thoughts on the comfort of the seats? I have read a few reviews but would like to hear what users actually thought. It's a perfectly fine PE product. When describing IB to people who haven't flown it I'd say it's about the world's most adequate airline. I honestly don't mean that as a negative either. It's never going to win any awards for being particularly amazing, but it's not bad either. It's about as middle of the road and unremarkable as it gets. So if it works best for your schedule and in the case of ORD-MAD is the only direct option, go for it. For our family, adequate works fine. 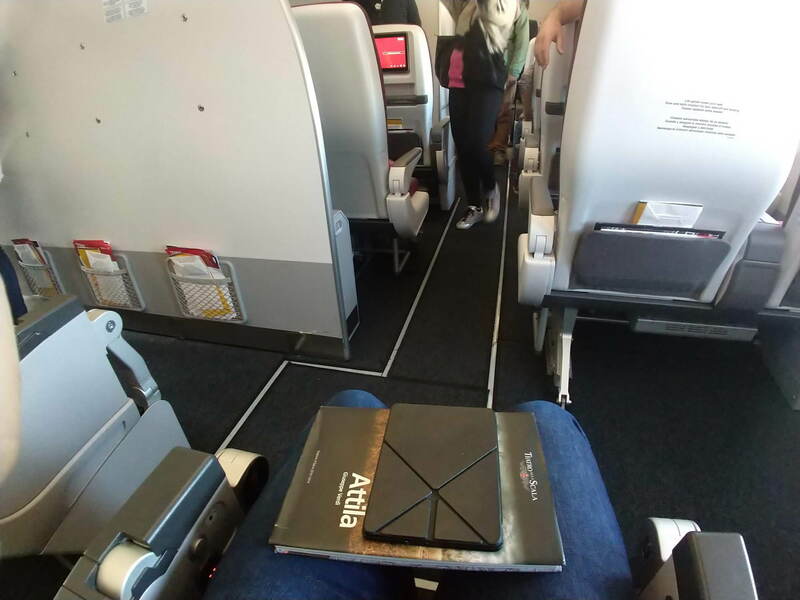 An eight hour flight isn’t all that bad and as long as the seats are comfortable in PE, we are good. Completely agree. In fact, I'm not really a fan of IB's Premium Economy, simply because their Y is so good (... or adequate, as you put it). That's my feeling too. Especially in the A350 with Elite status and access to row 21 I think that's an excellent Y and I don't see any reason to pay extra for Premium Economy (other than the Puntos Elite, since when it is discounted it can be a cheap way to renew status, earning 425 MAD-ORD against 500 for J). I'm 185 cm so just around the height where I really appreciate a bit of extra space. I also really can tell the extra recline when going overnight. I think it's a lot more important for overnight legs, though. But on an A350 there's much more legroom in the first row of economy. For longer flights the extra recline could make a difference, yes. Thank you for that description. With that delay on arrival in ATH, am I right in thinking that you'd essentially be connecting on separate tickets in MAD? If so, you would need a serious chunk of time - allow 1h30 to get to T2 (including immigration/baggage claim and the bus over), plus at least an hour to check-in for MAD-ATH, plus the amount of buffer you're comfortable with to deal with any delays. If you miss MAD-ATH, you're on your own. Definitely keep it all on one ticket. Terminal transfers from T4 are a massive pain. Thank you both. We have shy of 3 hours, no luggage, carry on only. The transfer doesn't both me much given we're accustomed to traveling internationally on points, making transfers fairly common. Assuming I interpret correctly, it appears the business product is not "worth" the headache and additional $500, while PE is sufficient for the 7 hour flight...? Neither of us sleep since this is for leisure, care about food, drinks, and the "fluff" of business. We simply enjoy the ability to extend our legs, recline, and feel comfortable. IF PE can deliver a comfortable "S" curve seating position (or close to) then I think we will take it over business. If the PE itinerary is on one ticket, I think it is clearly preferable (although I place little value on premium seats). For that length of flight and given what you say, it should be perfectly fine. Also, you mention that Miami outbound is not available. If MAD-MIA is available inbound you can still book your itinerary with Avios, either as an openjaw JFK-MAD-ATH-MAD-MIA (which requires you to call IB+) or as two one-ways (which can be done online if it is all IB metal). All times are GMT -6. The time now is 8:54 am.